European Cohesion Policy has always paid special attention to transparency. Today all European Regions publish lists of beneficiaries of Structural Funds as required by the Council regulations. But only a part of this data is in a machine-readable and reusable format. 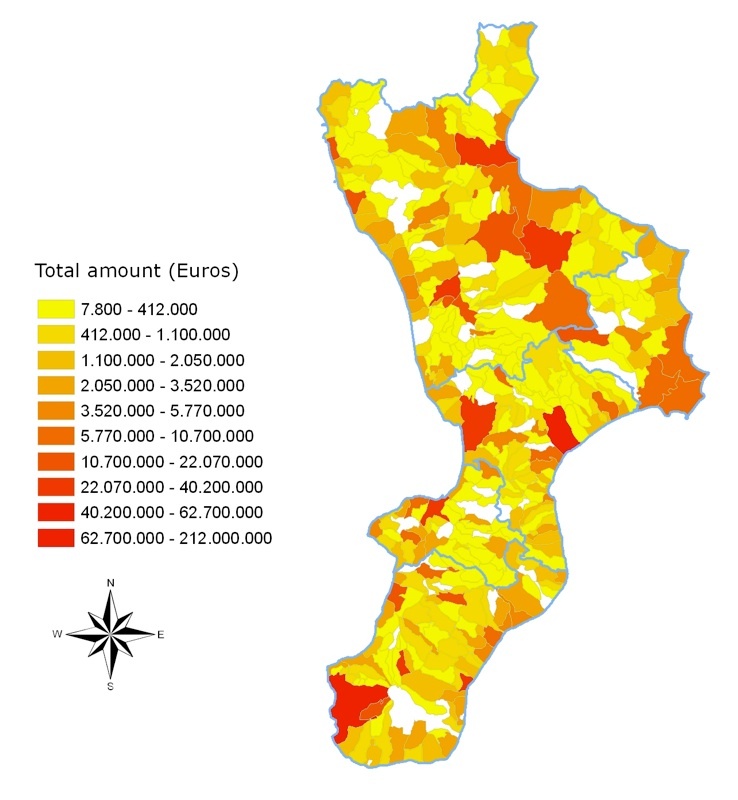 Italian region of Calabria represents a good exception. As the current debate on ‘government 2.0’ focuses on accessing public information as a way to foster open government and transparency, the availability of public data is becoming crucial for an effective delivery of new user-generated services. According to the last Ministerial Declaration on eGovernment, approved in November 2009, new demand-led information products and services enabled by the reuse of public sector information will support the transition of Europe to a knowledge-based economy. In this regard, great importance is attributed to the formats in which this data is published. It is universally recognized that a web page (i.e. HTML code) or a PDF file is not enough. To allow mash-up or geo-referencing, data should be machine-readable, preferably in open, standard and reusable formats such as XML, RDF, CSV (see for example WC3 guidelines). The European Cohesion Policy has always paid attention to the transparency issues related to the vast amount of public resources that have been assigned to the European Regions. According to Article 69 of the Council Regulation (EC) No 1083/2006 of 11 July 2006 laying down general provisions on the European Regional Development Fund, the European Social Fund and the Cohesion Fund and repealing Regulation (EC) No 1260/1999, the Member States and the Managing Authority for the operational programme shall provide information on and publicise operations and co-financed programmes. The information shall be addressed to European Union citizens and beneficiaries with the aim of highlighting the role of the Community and ensuring that assistance from the Funds is transparent. closing the gap between EU institutions and citizens through the improvement of the dialogue and listening. Consequently all direct beneficiaries (the public or private bodies or firms responsible for commissioning operations or, in cases of aid schemes, the bodies that grant the aid) must be published by the Managing Authorities under the rules governing the implementation of the 2007-2013 funds (EC No 1828/2006). The information must contain the name of the beneficiary, the names of the operations and the amount of public funding allocated to the operations. From this page of Inforegio web site (DG Regio of European Commission) it is possible to access to the lists of projects and beneficiaries published in the web sites of the Regional Operative Programmes and of the Regional Managing Authorities. As reported in the table below, currently most of these lists are provided in HTML tables or can be downloaded as PDF files, making them difficult to export to Excel or other applications and connect them to different databases for a more detailed analysis. 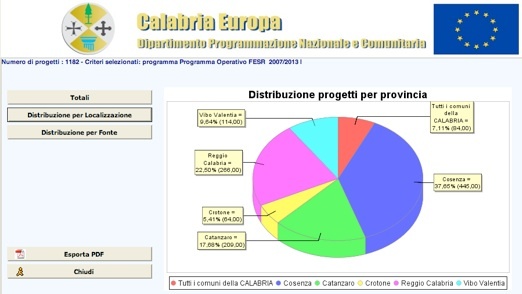 A good example of how this data should be published is the project database of Italian Region of Calabria, accessible online through the web site Calabria Europa. Through an interactive interface and an advanced search, users can look for specific projects, territories where the project impacts, Operational Programmes, measures, or expenditure categories and then to export the results in CSV format. It is also possible to visualize the data in terms of statistics, graphs and figures, and then export to a PDF. This tool is also used to report on the state of play and implementation levels of the policies funded, not only by the Structural Funds, but also by national funds such as the FAS (Under-utilized Area Funds). The tool includes data about the programming periods 2000-2006 and 2007-2013. 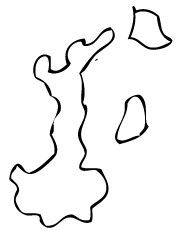 The most interesting feature is the search for a single municipal territory, which gives the opportunity, once exported to a CSV file, of geo-referencing the data with the greatest possible detail. As an example, the map below shows the total amounts allocated in the 2007-13 programming period, displaying the funds only for projects impacting on a single municipality.